This is what the actual matplotlib simulator looks like. You can change the functions in the source code. This is the output from the python console. This is where the mathematical data gets outputted after being processed by the code. ## Inspiration I'm extremely passionate about physics and mathematics, and programming. I decided to get data in the form of an equation and use the matplotlib library to graph this equation. I used my knowledge of physics and math to integrate the functions to get the values of volume and other cool things. ## What it does It displays graphs depending on the function you want. 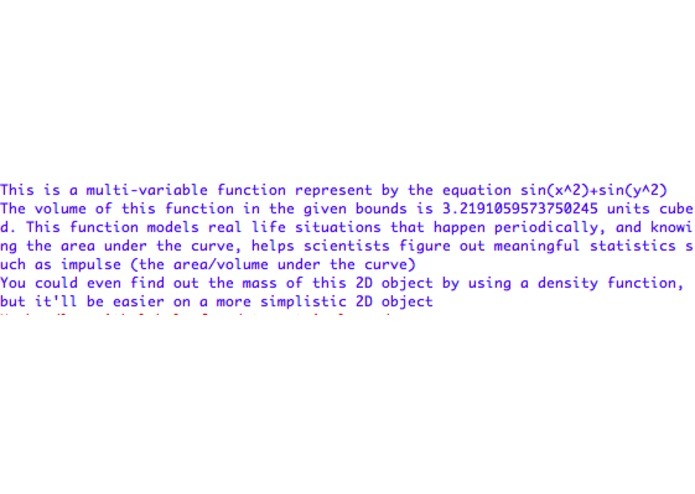 It could be any multivariable function (a function that considers more than one variable, and then produces an output), and it will graph that function on the 3D plane (x-axis, y-axis and, a z-axis). It will then give you some meaningful statistics by calculating the double integral of the multivariable function, to give you the area/volume under the curve, which by definition could be either impulse, or work of a given function. 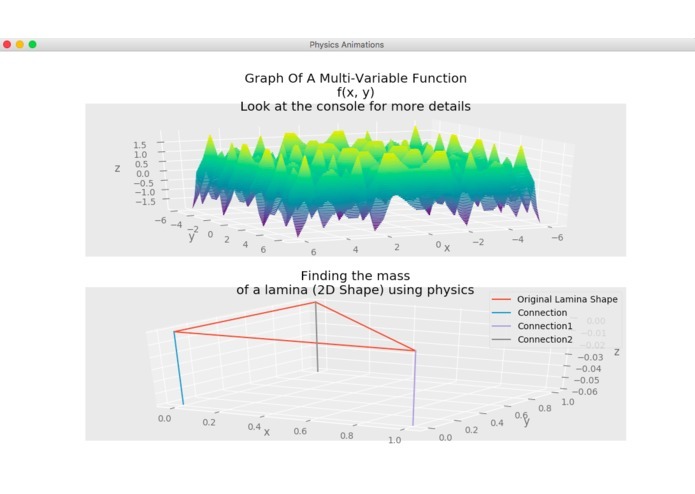 Also there is a subplot where it calculates the mass or combined electric charge of a lamina (2D shape of a 3D plane). ## How I built it I used matplotlib to create all the visuals present in the program, and used scipy and numpy to do the processing of the data. I greatly shortened the number of lines I had to code by using lambda functions. It can do simple to complex vector addition in just 1 to 2 lines of code, rather than going through the sometimes messy, normal way of implementing functions. ## Challenges I ran into One of the most hindering challenges was getting all the necessary packages for my project. Matplotlib was the biggest challenge I ran into while doing this. Matplotlib wasnt supported for my version of python3, which meant I had to delete python and re-install another version of python, which luckily worked with all the packages I needed. Also another huge challenge I ran into was how I was going to figure out what calculations to do to get the correct result. But, then, after some researching, I found a mathematical paper about how double integrals can be applied to physics. Then I implemented those ideas into my code, using the scipy package "integrate". Those were the bigest challenges I faced. ## Accomplishments that I'm proud of I'm overall proud of how my idea came to fruition. I really liked how the UI turned out, and the graphs look really professional and nice. I'm also proud of the way I debugged the code. At one point both my subplots were intersecting,and it didn't look very professional, but I realized my first subplot wasn't actually a subplot., so I'm proud about how I debugged code. I learnt more about the matplotlib engine, and I learnt that pure math and classical physics can be implemented in Python, which makes me much more interested in the language, because it combines a lot of my big interests. I would like to have GUI maybe built with PyTQ, and not just have all the information hard coded into the program.